Easy course navigation is key to successful learning management. We at Coursepath constantly improve user experience on the platform, in order to make corporate training more appealing and effective. Our latest release includes easier navigation through courses and course covers on all screen sizes. For each course, participants see their status (e.g. completed) when accessing the academy. Status gets displayed by a pie chart, which indicates the percentage of completion. A quick mouse-over reveals the percentage in actual numbers. Both, the menu and the academy pages are more prominent now. What was previously displayed in the left side menu is now shifted to the top of the academy. This gives space for the better visible course navigation, as described below. Navigating through a course has never been easier. Instead of the “Previous” and “Next” buttons on the bottom of a page, just use the always-visible forth and back arrows. No matter how big an image or document in your course is, you can intuitively step forward and backward in the course. On devices with bigger screens these arrows are on the left and right. On mobile devices these arrows are displayed on the bottom of the screen. 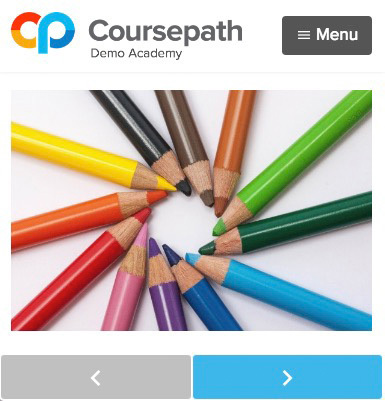 Coursepath’s new features are essential to meet participants’ needs who increasingly look up information on mobile devices. By adjusting the navigation within online training to mobile requirements, users of all devices can access training quickly and intuitively. We at Coursepath find it extremely important to display information where it is expected and save a user from searching for navigational instruments. With arrow buttons and more informative course covers, users have important information in a glance and immediately concentrate on the provided content.